Girls Who Golf is a fun and encouraging clinics series designed to expose the game of golf in a girl’s only environment. In the four session introductory series, she will gain golf skills to feel comfortable on the course and will learn valuable skills to become confident and positive individuals. We teach the girls about core values and successful goal setting. Most importantly, we have a blast! Clubs can be provided. Are you interested in learning to play golf to help with career development? Acquire skills, techniques and knowledge to help you get on the course where career changing opportunities are created. Women After Work is a 3-class series that is designed to introduce basic fundamentals to new golfers or can serve as a review for those that need a refresher. The classes will include conversations about basics rules, etiquette and golf nuances so you can confidently play with your colleagues or in your next company fundraiser. Golf clubs provided upon request. Join other like-minded women and sign up today! The first class is on Thursday, April 25th from 6pm-8pm and lasts 3 weeks. The Tiny Tees program is designed to give juniors ages 4-6 a fun environment to learn to play the game of golf! Classes are 1 hour long and are filled with fun, golf focused activities that will keep them coming back for more. In a safe environment where juniors can explore the golf world, they will be introduced to the sport in the most positive manner. The classes will include golf swing fundamentals, golf course introduction and course safety. Clubs can be provided. The first class is on Saturday, April 27 from 1-2pm and lasts 4 weeks. The Get Golf Ready program offers distinct levels. Please review the following chart to determine which program is right for you, click it for more information. Aren't sure? Please call The Game Improvement Team and we will be pleased to help you choose the right program. Programs are available in co-ed or women-only classes and you are welcome to put your own groups together. Click on one of the links below to Register for one of our scheduled sessions. Students can also create your own private class, minimum of 3 students required. This program is designed for the beginner golfer; ideal for the golfer that knows a little bit about but golf or has never had a lesson or may have played before but needs a refresher on the fundamentals. This is a developmental and mentorship program for girls, ages 8-17, either already part of a high school golf team or those who one day would like to play golf in high school or beyond. The format is guided towards good etiquette, proper practice routines, drills specific to each player, positive attitudes, and goal setting. Girls will receive on course instruction along with time at the practice areas improving their full swing and short game technique using video analysis. 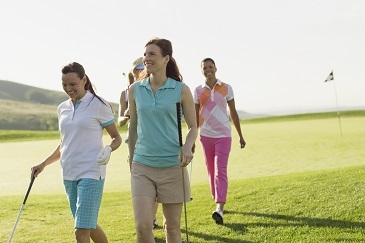 Girls will learn how to prepare for high school golf, local competitions, or just their casual round on the course in a welcoming team environment. This is a great way to learn new skills, work on your golf game and make new friends. Take part in all 12 weeks or drop-in weekly!